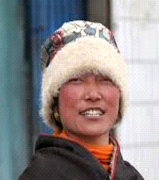 You could walk for weeks and never meet one Amdo Tibetan person who has heard the name of Jesus Christ. These nomadic people travel around the country-side with their herds of animals. They can assemble their houses in just over an hour, and work hard day in and day out to survive. They watch their herds closely, monitoring their safety, giving them food, protecting them, and giving of themselves for the good of their animals. It is sad to think that they don’t know about the Great Shepherd who has done the same for them. They wander aimlessly through life, trying to earn good karma so that they may be granted a better status in the life to come. There are over one million Amdo Tibetan people, scattered across the Himalayan mountains. There is no Bible written in their language. Some Amdo can speak the Central Tibetan language, which has a Bible. However, that Bible has many problems, using the same word for God as they do for Buddha and the word “karma” for sin. Please ask God to tear down Satan’s stronghold and enable missionaries to overcome the political, geographical, and religious barriers; learn the Amdo language; and translate the Bible. As God’s Word is provided, so will the light of truth penetrate this spiritually dark region of the world.